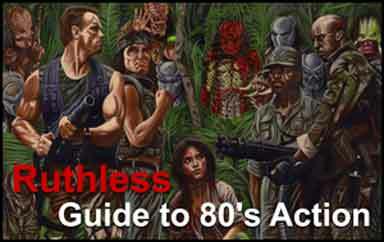 Perhaps the defining trait of the One-Hit Wonders of 80’s Action is that they clearly have no business appearing on film, but manage to steal the show, and a little piece of our hearts. CIA Bartender, played by Ronnie Barron, is about the seediest looking guy I’ve seen. No special make up was required, nor a fake eye-patch nor a gaudy tattoo. He simply looks, sounds and acts–though he is clearly not acting–like a bartender who primarily serves residents of the YMCA. Except it’s even worse, because these clientele are mostly Italian. He makes the bartender Homer encounters after not being allowed in Flaming Moe’s look like Tom Cruise in Cocktail. The directer must have loved him too, in spite of his total lack of acting ability or charisma because, in a stroke of neo-realism, Barron is forced into as many scenes as possible,: always a belligerent scumbag, tormenting our hero and obstructing righteousness at every opportunity. CIA Bartender even winds up being affiliated with the CIA at the end. Because CIA agents so often plant themselves in cheap, low-life bars for no reason. Once revealed as being in league with the CIA, this spit bucket of a man lords over the restrained might of Seagal in the most unjustified display of arrogance ever captured on film. It’s a moment of great dramatic irony, for we know what will come next. It turns out that among Barron’s lesser accomplishments, he was a prominent New Orleans session musician and a staple of Dr. John’s band. Barron also had three other film roles: Executive #6, “uncredited,” and one in a musical R&B film where he probably just played some music. It’s called Stony Island and boasts 19 votes on imdb. Yet thanks to his performance here, Barron was on the receiving end of one of the most satisfying shotgun blasts in the history of film.